ELON, N.C. — Despite almost a month hiatus from racing action, Jacob Borst is now prepared to make his second start in Southeast Limited Late Model Junior Elite Series at Greenville-Pickens Speedway this weekend, piloting the No. 25 Central Carolina Realty Pros machine. Fresh from a second place finish and a pole award in the Greenville Meltdown last month, which marked the opening event for the Southeast Limited Late Model Series, Borst is heading back to the circuit with even higher expectations. 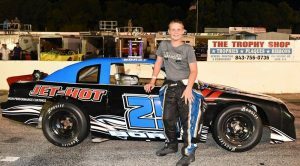 Having now a complete feature and additional practice laps under his belt, the former quarter midget standout is holding aspirations to become just the second victor in the inaugural season for the Southeast Limited Late Models newest division, which focuses on providing an affordable full-sized traveling late model series for drivers aged 10 to 15. Along with searching for his maiden late model win, this weekend will also be the debut between Borst and his newest partner, Central Carolina Realty Pros, which is a real estate service, located in Elon, N.C., that strives to deliver assistance to those looking to purchase or sell their homes. Borst will also showcase his Jet-Hot High Performance Coatings and Nichols Dodge Chrysler Jeep colors at the ‘Historic Half-Mile’ in South Carolina this weekend. Making the three hour tow to the racetrack, Borst will first contest in an open practice session on Friday for the Southeast Limited Late Model Series — all three divisions will be in attendance. Testing is scheduled to run from 8:00 a.m. Eastern until 5:00 p.m. Eastern. On Saturday, spectator gates open at 4 p.m. Eastern, with racing action being slated to start at 7 p.m. Eastern. Visit www.GreenvillePickens.com for more information on this weekend’s schedule. Make sure to follow Jacob on Facebook for cool photos and updates throughout the week — and be sure to check back soon to visit his brand new website, which is being constructed now. Jacob Borst from Elon, North Carolina is a developing racer competing in the Southeast Limited Late Model Junior Elite Series in the No. 25 Nichols Dodge Chrysler Jeep machine. Borst, 12, is a middle school student that has made his mark across various platforms in motorsports, starting at just four-years-old. Under direction from his father Justin Borst, the hotshoe Jacob has recorded various victories in go-karts, quarter midgets and even the competitive Allison Legacy Race Series. In fact, in 2015, Jacob finished second in the nation in quarter midget competition, racing in multiple states, such as North Carolina, South Carolina, Tennessee, Michigan, Connecticut, Alabama, Maryland, Ohio and Indiana. After his tenure in quarter midgets, Borst transitioned to the Allison Series, where he posted a fifth place finish in the championship standings (after missing the opening four races due to age restraints) and also became the youngest winner in the division’s history. 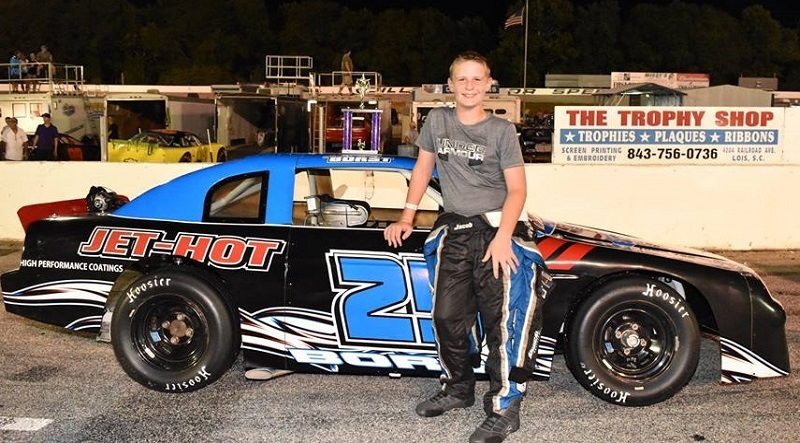 This season, Borst has now taken the next advancement in his racing adventure; competing in the new Southeast Limited Late Model Junior Elite Series, which is an affordable full-sized late model series for drivers aged 10 to 15. Borst’s marketing partners for this season include Jet-Hot High Performance Coatings, Nichols Dodge Chrysler Jeep, and Central Carolina Realty Pros.